[May 29, 2000 - Handed by Mark] Sinéad's special Mystery Train gig at HQ venue in Dublin on April 23 is being aired by RTE Radio 1 on Thursday, June 22 at 8 pm. [May 29, 2000 - Handed by Ken] Sinéad will perform as a special guest at the big KISS concert on June 3, organized by the Boston radio station Kiss 108FM. The tickets for the event are sold out. that describe themselves as HOT AC, No Man's Woman achieved "Most Added" status for the week, too: 193 plays at a total of 18 stations. No Man's Woman is also beginning to chart rapidly in several countries, and has already reached Top 20 lists in many nations. Radio & Records magazine, which is the the No.1 industry magazine in America for music tracking, lists No Man's Woman at #21 in its Adult Alternative Charts, and #17 in its ChartByte charts. [May 25, 2000 - Handed by Eamon] Sinéad is featured on the cover of Hot Press magazine's June 7 issue. The interview is also available in full through the Hot Press website. Go check it out! [May 22, 2000] No Man's Woman is currently at #22 in CD93's playlist and at #20 in WLIR's. Drop a line to the radio statations and request the song! [May 22, 2000 - Handed by Kai Chai] There's a high possiblity that the previously announced titles Rainy Day and Preacherman are actually retitled and made through the album; the first being Dancing Lessons and the latter The Lamb's Book Of Life. [May 18, 2000] Check out the articles section to read the first two interviews for Faith and Courage. INFO: The CD single is a German issue, with the catalogue number at0083. The second track is a brand new remix of This Is A Rebel Song and the oooooothird one is an Irish traditional done a capella. 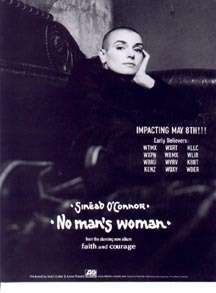 [May 10, 2000 - Handed by Ben] This is the promo poster for Sinéad's new single, No Man's Woman. [May 8, 2000 - Handed by Lita] Click here to read the Billboard review for No Man's Woman. [May 8, 2000 - Handed by Daniel] Click here to read the credits for No Man's Woman from the 1-trk promo CD of single. [May 6, 2000] Go check the articles section to read Sinéad's piece on Joan Of Arc, published by Irish Independent on April 9. She tells about the story of Joan as well as how she influenced her own life and career. She also comments on the new Luc Besson film and even on Madonna's closing song of the movie! Thanks to Sean who took care of the article and scanned it for all of us to enjoy! Rainy Day, Preacherman, Summer's End (which was released on The Avengers soundtrack back in 1998) and Full oooooCircle (a Loreena McKennitt cover recorded for John McKenzie's new film, When The Sky Falls) seem to have been left oooooout; probably to be used as b-sides for the upcoming singles. There are two additions, though -- The Lamb's Book Of oooooLife andDancing Lessons. 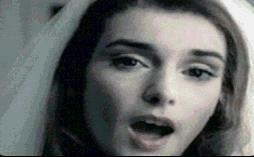 [May 3, 2000 - Handed by Eduard] The new Sinéad single No Man's Woman should be out on May 14. Below you can see the sleeve of the 1-track US promo of the single. [May 3, 2000 - Handed by Chantal] According to a DJ from a French radio station, the song Sinéad did together with Wyclef Jean is Rainy Day. [May 2, 2000 - Handed by Christian] Belfast News Letter reports that Sinéad will take part in a live show organized by BBC Northern Ireland and Hot Press magazine. The show will take place in the HQ Hall of Fame in Dublin on May 29. Click here for details and the whole article. This page is a part of the news database of Universal Mother for May 2000.